TOKYO, Apr 28 2008 (IPS) - Japan&#39s hosting of the G8 summit in Hokkaido in July will afford a rare opportunity for the Ainu people who live on the island to press their long-standing demand to be recognised as an indigenous people. Officially, for the Jul 7-9 summit of rich nations, Japan’s leaders have said they would like to see global health high on the agenda as also sustainable forest development, climate change and development. But the Ainu have other plans to roll out in Hokkaido at the Jul 1-4 Indigenous Peoples Summit, ahead of the G8 event. "If the government recognises the Ainu as indigenous people everything would change,’’ said Saki Mina, an Ainu leader, at a press conference here last week. There are about 200,000 Ainu living throughout Japan though most are concentrated in the northern island of Hokkaido. Ainu were once thought of as the remnants of a Caucasoid group but this is yet to be proved. Despite the passage of the United Nations Declaration Rights of the world&#39s 370 million indigenous people, last year, the country has yet to honor its promises and implement the declaration. The Ainu are disappointed that the government continues to display insensitivity to their demands. An open letter by Saki Toyama, an elderly Ainu woman reads thus: "I lived my life through clenched teeth, in frustration and embarrassment. People have asked me, &#39Why do these people called Ainu exist?&#39 &#39’. ‘’Do you have any idea of the wounds inflicted by these comments? I don&#39t know how much longer we can keep our silence. Young Ainu, I ask that you fight and that you endure." Much of Ainu society and culture has suffered progressively destruction as a result of assimilation policies enforced by successive Japanese governments, and many Ainu have experienced prejudice and been forced to live in poverty. As a result of such discrimination, Ainu culture and traditions are in crisis, but not completely lost. According to the Foundation for Research and Promotion of Ainu Culture, there is now a concerted move to preserve and "soundly pass down’’ Ainu culture and traditions. Mina, a member of the younger generation, is now proud of being Ainu. Her life changed at 16 when she met other indigenous peoples on a trip to Canada. "Ainu was a word I didn&#39t dare speak in this country before, but now I can say it with pride," she said "I was so shocked when I met them. They were dancing and singing because they had so much pride in being indigenous people. They gave us courage. I know at the summit we can make Japanese aware of our situation." About 1,000 people will participate in the event, including delegates from the Philippines, New Zealand, Australia, United States, Russia, Norway, Guatemala, and Taiwan according to Victoria Tauli-Corpuz, chair of the United Nations Permanent Forum on Indigenous Issues. There are about 5,000 groups of indigenous people living in more than 70 countries. They represent only 4 percent of the global population, but make up the various cultures in about 70 -80 percent of the world. The group will submit an appeal to the world&#39s leading industrialised leaders who will gather in Hokkaido in July for the G8 summit. It calls for recovery of indigenous rights, education and language, environmental protection and full recognition of the Ainu&#39s status as an indigenous people. Urawa Haruso, an Ainu elder man with a long, white beard, believes there has been a continual destruction of Ainu lands and denial of basic rights. He gave one example: "We applied for fishing rights to fish in a river for salmon in Hokkaido. However, we discovered the government put up a 4 meter high wall, so that the salmon could not return up the stream. It made us feel devastated and hurt." Today, he says, there is no control on fishing,resulting in the fish stocks dwindling to about a tenth of what existed 60 years ago. "The Japanese government says they are concerned about global warming and are prepared to do something about it," he says. "But I have my doubts. The government and its people are still very much attracted to bribe money that comes into their pockets; they do not want to change the status quo. I am gravely concerned." The Indigenous Summit will send out a message with groups from around the world for the earth and for future generations. 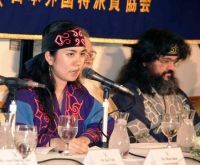 The Ainu have their own language, Sinu, and have developed a rich culture that includes oral literature such as the "Yukar" epics, traditional rituals such as the "iomante" ceremony, and unique fabric patterns. "But I’m worried all my efforts could be neutralised by discrimination and we will not be granted indigenous rights by the Japanese Governments," says Koiji Yuki. "I have four children and I always talk to them about our culture and history." However, Yuki is hopeful that the Ainu will be granted the recognition they demand through dialogue at the G8 summit.